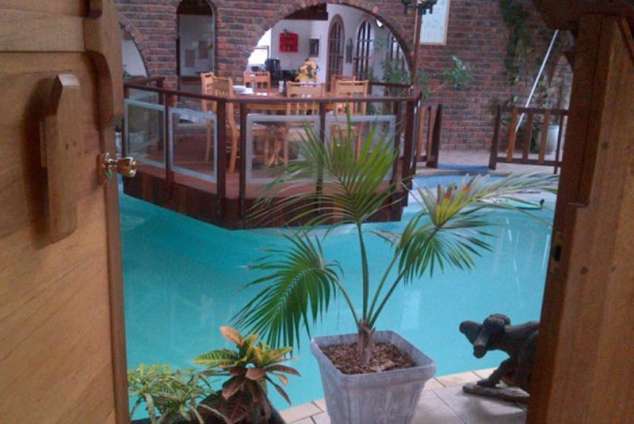 Dolphin View Guesthouse - Jeffreys Bay Accommodation. Dolphin View Accommodation Jeffreys Bay located 45 min from Port Elizabeth in the Malaria free Eastern Cape of South Africa. The Guesthouse located in the tranquil Noorse Kloof Nature Reserve not far from shops and town offering Bed and Breakfast and Self Catering options. From the Guestrooms you have stunning views over the reserve and the ocean and you can enjoy the prolific bird life from your private balcony. Dolphin View JBay offers a Indoor Pool and BBQ. Accommodation consists of four Double Rooms and two Family Rooms. Guest Areas include Indoor Pool, Indoor BBQ Area and Outdoor Entertainment Area. Free Wi-Fi Available. This unique setting gives you a change to be close to nature while still staying central in town. All the main facilities of the town are only 2-4 km away. We offer a 24/7 Cab Service to local Restaurants and Activities. The guesthouse is graded as 3 star and has 6 en-suite rooms from which 2 are family units. All rooms have the necessary amenities to make your stay as comfortable as possible. 5 of our 6 rooms have balconies with stunning view and 3 rooms have a bath for relaxation. All rooms have a TV, fan, heater coffee and tea making facilities. Each room is individually decorated with cosy theme to give you the home away from home feeling. The Guesthouse is situated in a Cull de Sac offering you a relaxed and safe atmosphere in a quiet and peaceful area with breathtaking views over the ocean and reserve, where more than 50bird species are known to make their home. In the nature reserve you also find Rock Dassies and Antelope. Enjoy our indigenous gardens while soaking up the sun in this relaxed setting. Or you can lay yourself down in one of the comfortable sun loungers while your children enjoy the jungle gym and trampoline. Your host speaks Dutch, Afrikaans, English and German. The guesthouse features an inhouse tour operator for your touring and transfer needs. Please ask you host for more information. All rooms have heaters, fans, tea and coffee making facilities and all the needed toiletries. Full English Breakfast served. Large room with en-suite bathroom(Shower and Bath), private lounge and balcony overlooking Nature Reserve and Ocean. Two comfortable rooms with en-suite bathrooms and private balcony's overlooking the Reserve, Gardens and Ocean. Comfortable room with en-suite bathroom and private balcony overlooking the Reserve, Gardens and Ocean. Two comfotarble family rooms with en-suite bathrooms, kitchenette, private outside seeting areas with BBQ (Braai) facilities. If you come into Jeffreys Bay from Port Elizabeth you enter on the main road which is Da Gama Road. You continue until you see a petrol station on the right hand side after that the Spar Supermarket and after that the Checkers. At that STOP street you turn right up the hill into Noorse Kloof Road and then you take the second STOP street to the left into Dogwood Road. Then you take the 4th street left again. This is a dead end street and the number is 30. You can park on the large grass area next to the house. There are signs on the road. If you come from Cape Town you take the turnoff Jeffreys Bay and drive down towards the ocean passing 3 traffic circles. You continue until you see Rona Nursery and SMARTH security on your left hand side. At the nursery and SMARTH office you turn left into Disa Road. Then take the 1st street left into Aandblom. You continue this road (Dogwood) until the first stop street. There you go straight, then the first to the right. This is a dead end street and the number is 30. You can park on the large grass area next to the house. There are signs on the road. 5211 page views since 17 Oct, 2008.